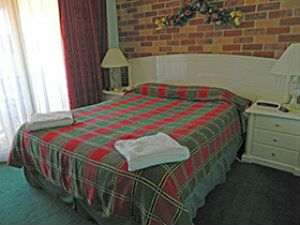 Comfortable Apartments and Townhouse accommodation. 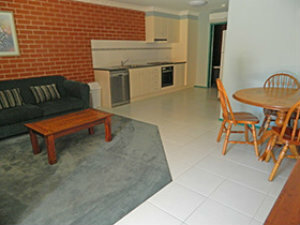 All have full kitchens, living/dining rooms laundry, microwave, large plasma or Lcd TVs and airconditioners. 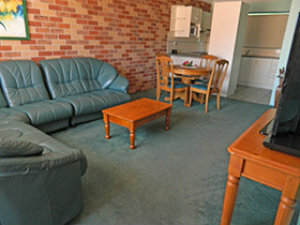 Modern one bedroom apartment with full kitchen facilities, including dishwasher, stove/oven, microwave, full size fridge. Living/dining room, 2 lounges,106cm LCD TV. Bathroom, combined washing machine/dryer. Separate bedroom has queen bed and single bed. Apartment has reverse cycle air conditioning. All linen and towels provided. Two storey townhouse on the upper level there is: 2 bedrooms, Queen bed in main bedroom with LCD TV and 2 single beds in the other room, plus bathroom with bath and toilet also on this level. Ground level has 2 lounges, 106cm Plasma TV. dining table/chairs, full kitchen with stove/oven and microwave, plus cooking utensils, full size fridge, Laundry with washing machine and dryer and 2nd toilet. 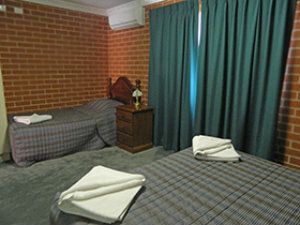 Townhouse has ducted reverse cycle air conditioning and all linen and towels provided.